As a final installment in the highly successful Skateboard Showdown series, Run My Game and Open Road of New York are holding one last skate contest before the snow hits. The Halloween Hellraiser takes place at the New Design High School in LES, NYC this Saturday, November 1, 2008. 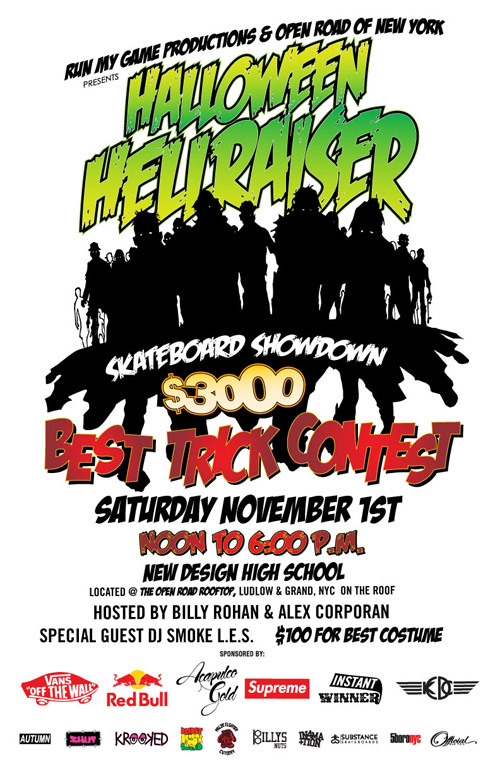 $3000 in cash is on hand for Best Trick, while $100 has been set aside for best-costume. The Billy Rohan and Alex Corporan hosted event, will also feature music from DJ Smoke LES, as well as sponsorship from the likes of Supreme, Acapulco Gold, Vans and SHUT. With the Halloween theme, this is definitely not one to be missed. Check out the flyer below for my information. Nike SB Dunk Low Premium "Mosquito"